Unlike most other popular web browsers such as Google Chrome and Mozilla Firefox which stores the Favorites or Bookmarks in databases or HTML files, Microsoft Edge web browser continues to save individual Internet shortcuts for all web pages that are saved as Favorites, much similar to Internet Explorer (IE) browser. However, the Favorites folder location for Microsoft Edge browser has changed. 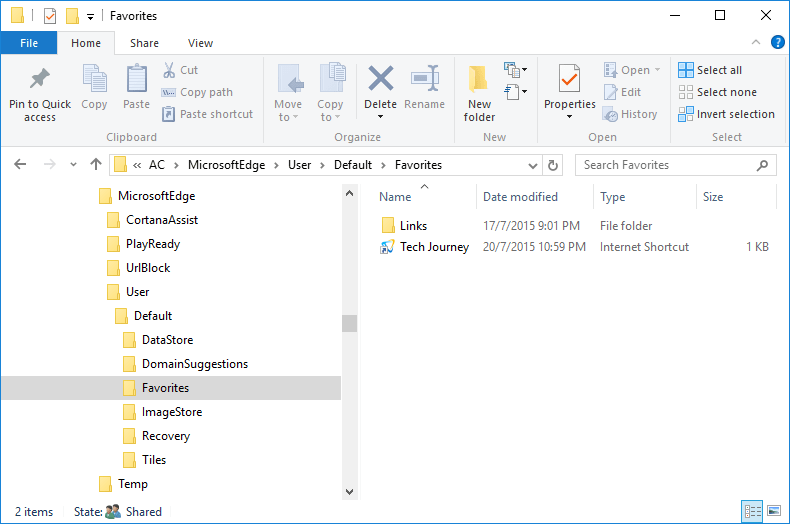 In IE, the Favorites folder is located in %UserProfile%\Favorites, in which you can find all the Internet shortcuts of the web pages saved as Favorites. In Edge, the Favorites folder is now located at %UserProfile%\AppData\Local\Packages\Microsoft.MicrosoftEdge_8wekyb3d8bbwe\AC\MicrosoftEdge\User\Default\Favorites. Inside the folders, you can see all the Internet shortcuts of all Favorites added in Edge. You can easily copy all them for backup, and add or delete as you wish. Note that all changes you make in the folder will reflect in Edge’s Favorites list. Update: Beginning from Windows 10 Build 1511 officially, Edge is now using ESE database to store the favorites.